GUADALAJARA, Mexico -- The bound and gagged bodies of 26 men were found dumped before dawn Thursday in the heart of the picturesque city of Guadalajara, a sign that full-scale war between drug cartels may have come to the metropolis that hosted last month's Pan American Games. 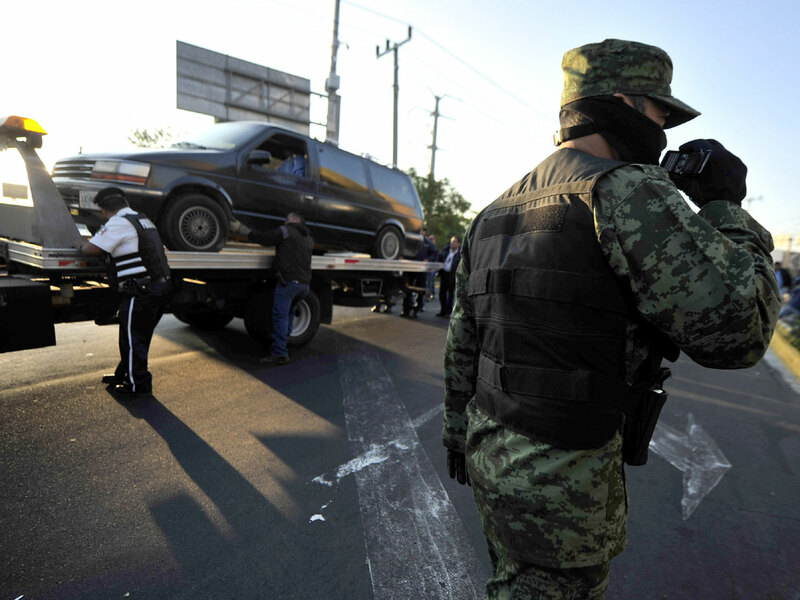 Law-enforcement officials said the men were found, shot execution-style, in two vans and a pickup truck abandoned near the Milennium Arches, one of the most recognizable landmarks in Mexico's second-largest city. A message was found with the bodies in one of the vehicles, said Luis Carlos Najera, public security secretary for the state of Jalisco. He provided no details, but Mexican cartels frequently leave threatening messages with the bodies of their victims as a way of sowing fear and taking credit for their actions. The bodies were found about a mile (1.6 kilometers) from the Expo Guadalajara events center, the site of both Pan Am Games events and the Guadalajara International Book Fair, which opens Saturday and describes itself as the world's most important Spanish-language book fair. The fair's website said it was expecting more than 600,000 visitors from around the world. On Wednesday, 17 bodies were found burned in two pickup trucks in a strikingly similar attack in Sinaloa, the home state of the eponymous cartel. Twelve of the bodies were in the back of one truck, some of them handcuffed and wearing bulletproof vests.